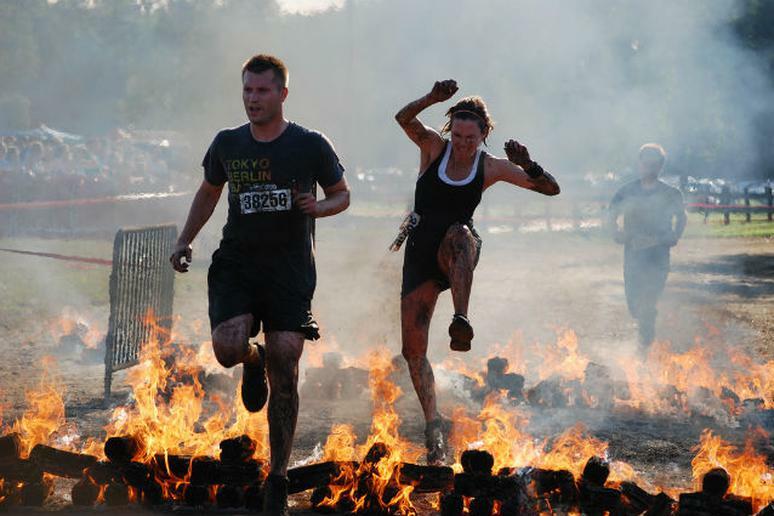 So, you signed up for your first obstacle race (maybe a Tough Mudder, a Spartan Race or a Warrior Dash) and now you're wondering what you should do to train for it. Of course, we're sure you're aware that prepping for an obstacle event involves more than say, what you would do to get ready for a 5k. Since the process is a bit more involved, we decided to get all of the important details from a pro. Erin Beresini is an endurance athlete who's completed obstacle races such as The Ultraman Canada, CA Triple Crown, Solo 24hr MTB, Tough Mudder and Spartan Ultra Beast (completing a Spartan Race of every distance in one year). She's also a three-time Ironman, Xterra AG World Champ, a Boston Marathon qualifier and the author of "OFF COURSE Inside the Mad, Muddy World of Obstacle Course Racing." Needless to say, she knows a thing or two about prepping for and racing in obstacle events. Her first and most important tip: focus on building strength. "You want to be able to give every obstacle a shot, and if it’s your first race, chances are the distance isn’t too long," she said. In other words, don't worry too much about training for cardiovascular endurance (e.g. running). Your main concern should be getting your body strong enough to handle the obstacles you'll face. What should you do specifically to build strength? Beresini says simple exercises will work fine. "You don’t have to go bonkers—basic bodyweight moves reap big rewards, she said. "Pushups, pullups, rows, squats. Kettlebell swings and sandbag or bucket carries are also great." And what about training volume and frequency? Bereseni suggests that those who are new to strength training start out slow. "It’s probably wise to start at two days a week, with three days in between sessions. That should be enough for most 5K races," she said. "When I was training for the Ultra Beast, I worked my way up to doing strength workouts for about an hour, five to six days a week." Ultimately, the amount of training you'll need should be based off your current level of fitness as well as your goals. And speaking of goals, Beresini says that instead of racing the clock (like you would in a traditional road race), you should focus more on having fun. "If you want to race for time, most events will let you," she said. "Otherwise, forget about the clock and enjoy it." The best piece of training advice Beresini shared: get creative with your training. "Realize none of your training must be done in a gym," she said. "The best part about obstacle racing is it gives you permission to be creative. You can do an entire strength workout at the local park—rows using swings, cross the monkey bars." And as far as nutrition goes, Beresini said you probably don't need to make any drastic changes to your diet. "If you’re eating a well-balanced diet rich in fruits, veggies, protein and omega-3s, there’s probably no need to do anything special," she said. "That should be enough to give you the energy you need, help you build or maintain muscle mass, and recover quickly." And finally, perhaps her most important piece of advice is to listen to your body and make sure to let it rest.